and it reminded me that I wanted to share this recipe. After learning to make this soup (which we absolutely love), I always make sure we plant lots of sweet potatoes. This is a simple farm recipe from my friend Amy, that is nutrient rich (sweet potatoes are very good for you), hearty, and uses only a few ingredients. Even though it’s simple, it’s delicious and I make and freeze lots of it for quick and easy lunch and dinner throughout the fall, winter, and spring. In the original recipe, country, maple or sage pork sausage was recommended, but we’ve found that we prefer the local hot hungarian sausage in it – but then we enjoy spicy foods. So, you can vary the sausage to suit your tastes; but so far, every different variation, we’ve enjoyed. This soups got it all – easy, nutritious, hearty, and adaptable to your preferences. Those sweet potato plants will be going into the ground by the end of the week! Rinse sweet potatoes but do not peel. Coarsely chop the sweet potatoes and onion. 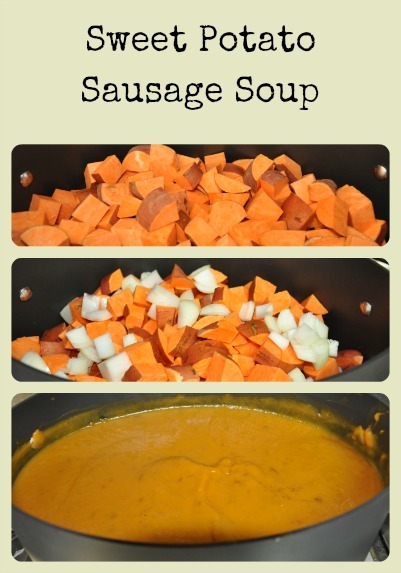 Place in a large soup pot or crock pot. Cover with broth or stock (to about an inch above the vegetables). If cooking in a crock pot, cook on high for 5 hours or low for 8 hours. 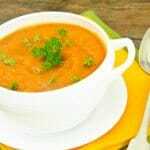 If simmering in a soup pot, the time is usually reduced considerably and the potatoes should be cooked until they are soft. While the potatoes and onion are cooking, cook the sausage in a skillet and drain fat. Puree the sweet potatoes and onions with a stick blender. Add the cooked sausage, salt, and pepper. Just before serving, add the cream and reheat for about 5 minutes.